After launching Far Cry 5 in 2018, Ubisoft Montreal is bringing players back to that game’s Montana setting. However, this direct sequel is far from a retread. 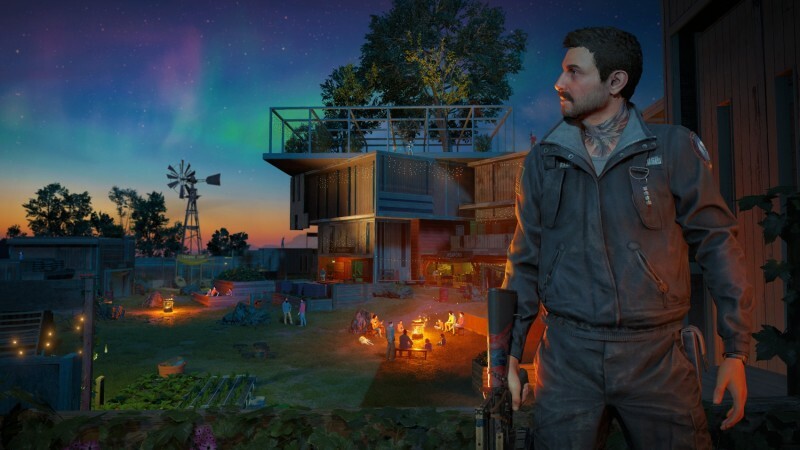 The Hope County you explore in Far Cry New Dawn is drastically different, as a global nuclear apocalypse has destroyed most of human civilization. You step into the shoes of a new character hoping to help the residents of Hope County in a unique twist on the franchise. I recently visited Ubisoft Montreal to learn more about the game, and here are 12 key takeaways I had from my day in the offices. 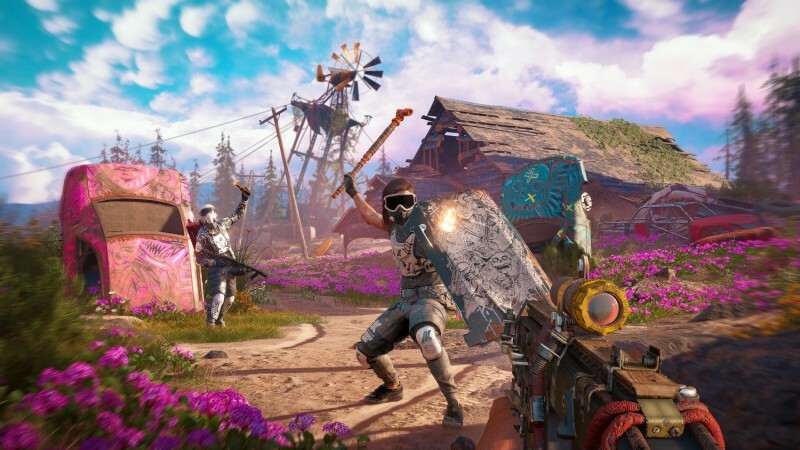 Far Cry New Dawn looks to be a fun spin-off entry in the Far Cry franchise with an interesting take on the post-apocalypse. With the title launching on February 15, we don’t have to wait long to find out if Hope County is truly worth saving. 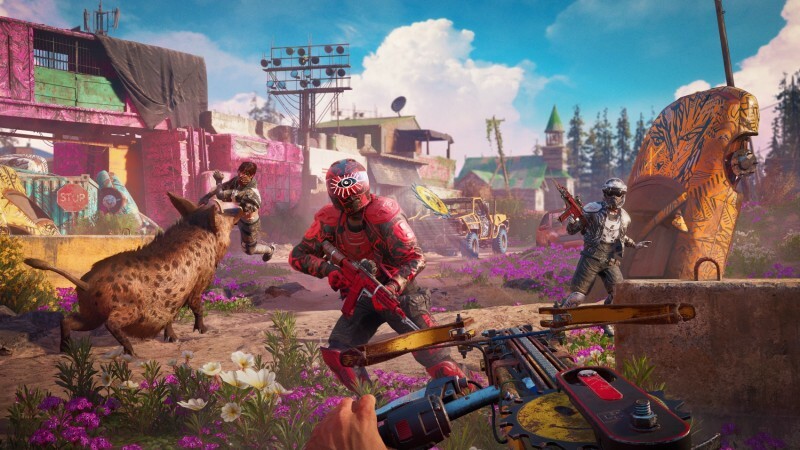 Though Far Cry New Dawn is meant to be a standalone title, players who worked through the campaign of Far Cry 5 will notice definite continuations from that story. 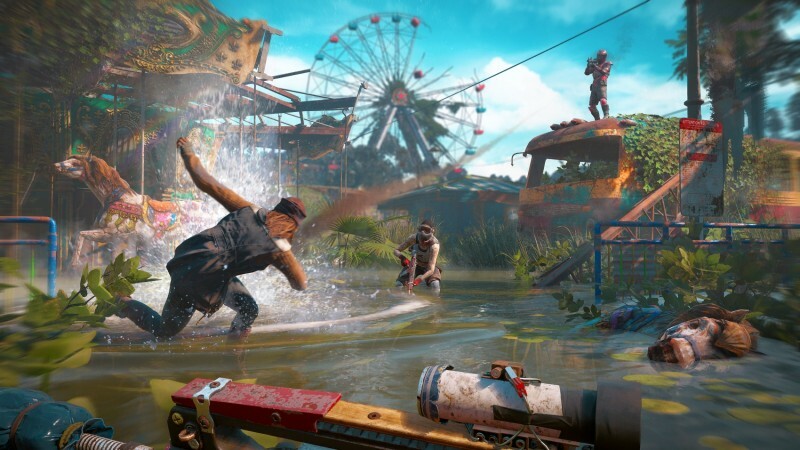 Many of the cult’s structures have been repurposed in this post-apocalyptic world, and we even got a glimpse of cult leader Joseph Seed, the primary antagonist of Far Cry 5, at the end of the reveal trailer. 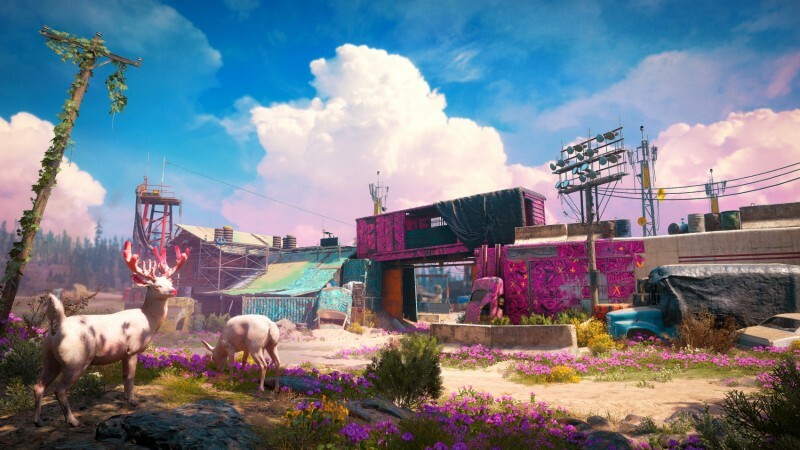 Rather than going for the stereotypical gray and brown aesthetic many people associate with the post-apocalyptic concept, Ubisoft Montreal researched how the planet would react to and recover from an actual nuclear war. According to their research, the first six years would be a nuclear winter featuring low temperatures, a dead landscape, harsh winds, and new biomes forming everywhere. After the first six years, the sun and rain returns, leading to a “super bloom” event that leads to vegetation reclaiming the planet beginning at year 10. 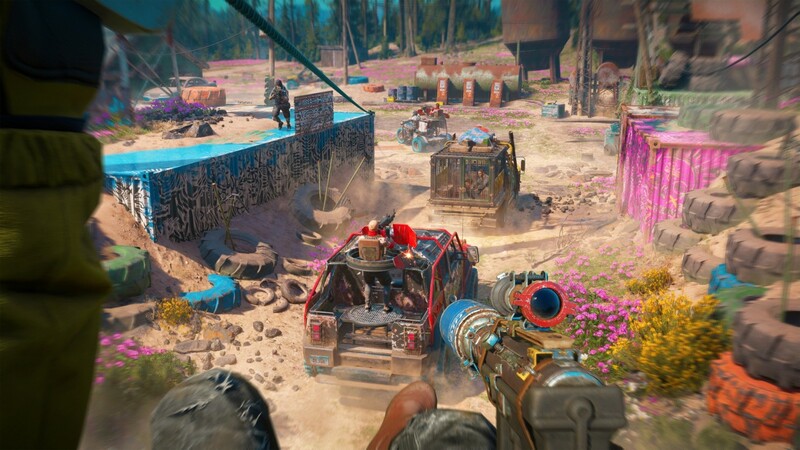 Far Cry New Dawn takes place during the super bloom, 17 years after the nuclear war of 2018. While the vegetation is thriving thanks to the meteorological shift, the radiation has infected and mutated some of the wildlife. I didn’t see many examples of this, but I’m interested to see what the team does with this idea. Another theme Ubisoft Montreal is pursuing with New Dawn is the idea that nothing is being manufactured anymore, so everything from buildings to weapons has a makeshift feel. This is most evident in the series’ zaniest weapon yet: the Saw Launcher. This device uses circular saws for ammunition, launching them at your targets. It starts out shooting one saw at a time, but you can upgrade it to shoot multiple at once; the highest I saw was three saws, which all ricochet off objects and into enemies in a satisfying manner. You control a character who was a part of a group that was moving up the west coast to rebuild civilization. Unfortunately, the train they’re on is ambushed by a marauding gang called the Highwaymen and the dream of this group rebuilding the civilization is squashed for the time being. 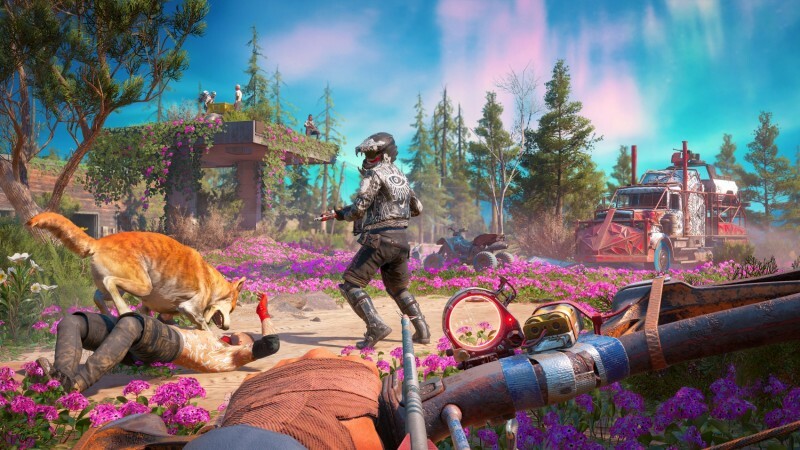 Far Cry New Dawn centers on this conflict between the survivors, who are building a community for the future, and the Highwaymen, who don’t think the world is salvageable. Instead, they move from city to city consuming all the resources and living for today. As you might imagine, your character aligns with the survivors at their home base of Prosperity. The survivors decide that in order to survive and rebuild civilization, they need to run the Highwaymen out of town. The Highwaymen are led by twin sisters Mickey and Lou. Their families secured the docks shortly after the apocalypse, giving them access to abundant resources. However, the resources didn’t last long, and the two fought to be at the top of the food chain. Mickey and Lou are currently in Hope County, but the Highwaymen are spread across the entire country. Since the nuclear event wasn’t localized to Montana, the bombs affected other parts of the world. If you’re in need of resources, you can embark on expeditions, which take place in other areas of the country. During a live gameplay demo, I saw one expedition take place in a Louisiana swamp. An abandoned theme park serves as the setting as I watch the character infiltrate a camp and recover resources. Over the course of the game, players can also travel to another location on the west coast of the U.S., as well as an Arizona location. These additional areas are reused throughout the game, so the Louisiana expedition I saw isn’t the only mission taking place in that region. 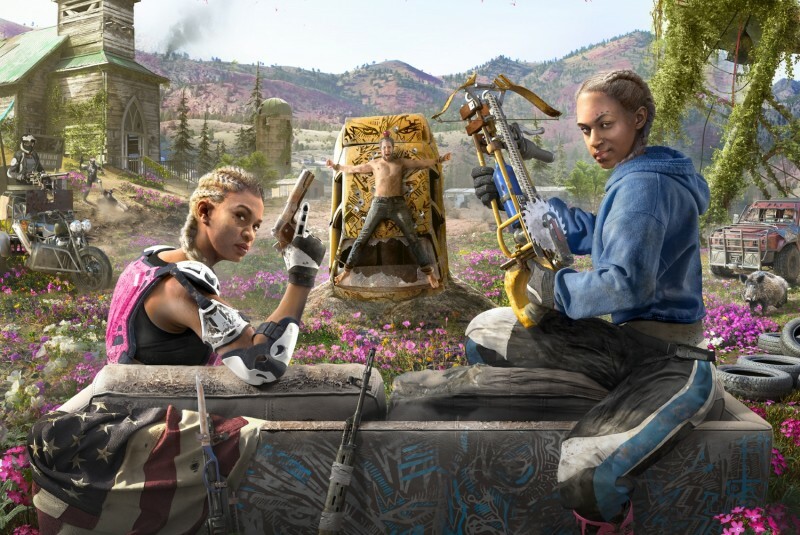 While you’re in Hope County, many of the standard Far Cry activities are at your disposal. You can embark on treasure hunts, which often involve a twist of some sort; the treasure hunt I saw has you infiltrate a wolverine nest to retrieve a key, but wolverines are the least of your worries once the barn you’re inside goes up in flames. You can also work across the map and clear outposts where the Highwaymen are stationed. 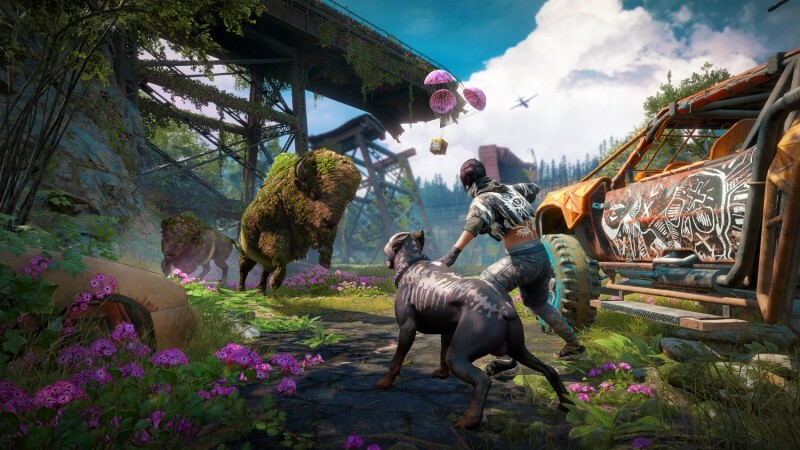 While outposts are nothing new to the Far Cry series, New Dawn adds a new gameplay loop to them. Once you take down an outpost, it becomes a fast-travel location for you. However, you can choose to send those in that outpost to scavenge for additional materials, essentially abandoning it and allowing the Highwaymen to retake it in exchange for resources. Once they reclaim the outpost, you can take it back, but it will be more difficult the second time around. Enemies now have difficulty levels ranging from one to three to indicate how hard it will be to take them down. If you stir up too much trouble and raise the alarm level, high-level enforcer enemies will join the fight to present extra difficulty. If you need some help, you can play cooperatively or bring a Gun for Hire or animal companion into a fight. These characters unlock as you play through the story, and can learn additional abilities as you use them more. For example, one of the Guns for Hire is a grizzled, elderly woman named Nana, who happens to be the sharpest shot in Hope County. This sniper is an ideal companion for stealth missions, as she can unlock abilities like using a silencer or being able to shoot through cover. The other Gun for Hire I saw was Carmina, who is the daughter of Nick and Kim from Far Cry 5. Since she’s only 17 years old, she doesn’t know of a world without the apocalypse. 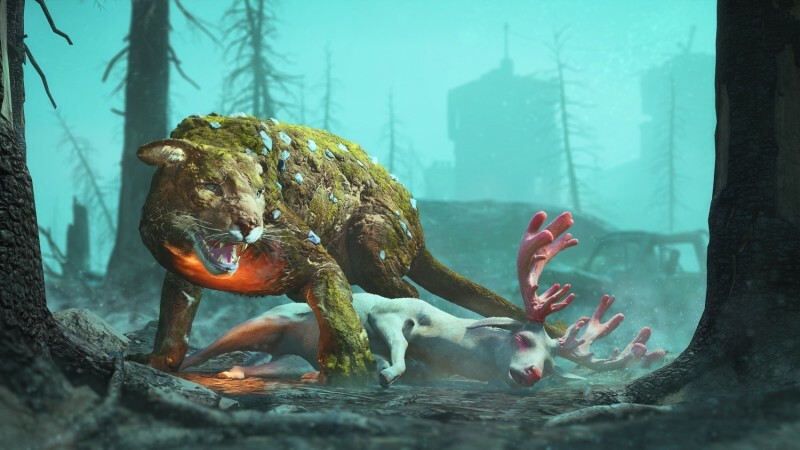 Two new animal companions are also unlockable. Though Boomer the dog from Far Cry 5 is long gone, Timber fills his role as the new canine companion. Timber not only has some new takedowns, but he can also ride in vehicles and scare away larger animals. I also saw Horatio, a giant boar. This monstrous beast draws the attention of the enemies in the area and can be a tank to take down. A simplified weapon and item wheel screen helps streamline the process of getting to the object you hope to use. Now when you open the weapon wheel, the consumables and crafting menus are listed on the sides of the screen. This means you no longer need to flip between wheels to choose the item you want.